This is about motorway services in general. For the operator Motorway Services Ltd, see Trusthouse Forte. A motorway service area is any state-approved facility designed to rest drivers who are using the motorway network. They are run entirely by private operators but regulated by the Department for Transport through Circular 02/2013 (in England only, though similar policies apply across the UK). They are either infill, core or reserve, and online or offline. This whole website is all about them. An early motorway service area. Any facility designed to serve travellers could claim to have had an influence on the motorway service area, but the closest relative is the coaching inn, which set up at the crossings of major routes to rest horses and their owners. They were usually located every few miles and offered food, accommodation and stables. One of the benefits of motorways is that local businesses are not allowed to set up alongside, making the road faster and safer. When the M1 was being designed, concerns were raised that people wouldn't be using the road because they liked the security of having somewhere to stop. A rushed survey was sent out to gauge the level of interest in a small number of commercial facilities being provided along the road. Two very different services opened with the M1 in 1959: Blue Boar's rudimentary Watford Gap and Motorway Services Ltd's exquisite Newport Pagnell. There was no time to assess the benefits of these, so the format was simply copied across the motorway network. 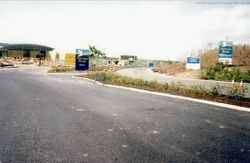 When motorway services were first proposed, it was assumed their main function would be to help rescue broken vehicles. Finding a company who were skilled in this, selling fuel and running a restaurant was difficult, and the breakdown service was frequently cut-off by competitors. It was formally cancelled in 1977, with services focussing on fuel, catering and now motels instead. If you think about the phrase "motorway services" too much, it begins to hurt your head. The phrase is a shortening of "motorway service area", and it refers to a single building or place, so is a singular even though it looks like it should be a plural. Our research suggests this is because "Motorway Services" is actually a brand name, a bit like how "Hoover" is a trademarked name that is frequently used as a verb. Until the 1970s, motorway services were referred to as service areas (SAs). The company Motorway Services Ltd (their name literally meaning "we provide services on the motorway") were heavily involved in the 1960s, and their name appears to have become synonymous with them all. That may explain how the few members of staff who had to negotiate with Motorway Services Ltd on behalf of the Ministry of Transport started to get it wrong. However, their name was rarely used publicly, so we're left unsure as to how the public came to be familiar with the phrase "motorway services". It's possible that the company leaked to the public enough for it to catch on, or it may be that they read it in press releases. The other possibility is that the word "services" was commonly used to describe the combination of restaurants, toilets and fuel, so people instinctively stuck the word "motorway" in front of it when talking about the new facilities. Signs from developers explaining they're leading the development. In England and Scotland, the government would originally identify suitable sites for motorway services as one of the last stages of motorway design. Interested firms would then bid for a contract to build and operate the services, with one aspect of their tender being a combined fixed and percentage-based rent payment. In the 1980s, operators were allowed to suggest potential new services, but the land would still be acquired by the government. In England in 1992, developers and operators became solely responsible for identifying, purchasing the land and obtaining planning permission for new services. This process already applied in Wales and Scotland, and later applied across Ireland. This change was brought about to encourage more frequent, smaller services, which would be easier to plan and build. 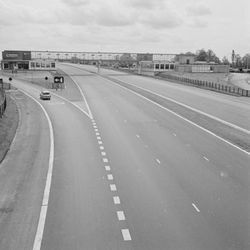 The original policy of having the government own the land motorway services were built on, and having them dedicated for such a purpose, meant it was very clear whether something was a motorway service area or not. Since the first motorways opened enterprising landowners have built hotels and petrol stations next to motorway junctions but these clearly didn't meet the definition. Now the land is privately owned, the definition of a service area is that there must be a signing agreement in place between the highway authority and the landowner. This causes a problem for enthusiasts because, in the UK, road signs are very inconsistent. Sometimes small petrol stations will be told they don't qualify, sometimes they will be told they can have signs because there are no services nearby, sometimes they'll ask for signs and get them even though they clearly don't qualify and sometimes they'll get signs even when they didn't ask. That's not to mention the cases where different signs to normal have been used, such as replacing services with "hotel", "local facilities" or "rest area". To the casual road user, everything is simple. To enthusiasts, trying to count how many services is impossible because there are too many jokers in the pack. However for highway authorities and landowners it creates a constant battle over what does and doesn't qualify. They are usually located at 30-mile intervals. Road signs are dealt with in detail on the Motorway Signs page.